The other day my life changed forever (I don't think I am being overly dramatic). I discovered happiness I never knew possible (Still not overly dramatic). I was lying in bed, although it was not yet bed time. I was simply not feeling well and took the chance to have a rest, when my Mum came home. She came into my room to say hello and show me what she had bought. I never guessed she had bought something for me. 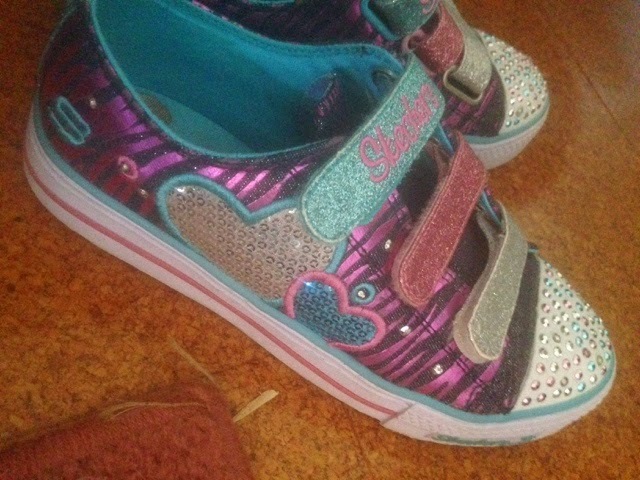 Out of a box came these gorgeous, sparkly, velcro-tabbed, purple, pink, blue and silver sneakers. I could not say a word. I only gasped and smiled, my love of these shoes knew no boundaries. Suddenly, Mum turned off my light in my room and threw the shoes on my bed. When they landed, they flashed and lit up. I squealed and squealed. It was like Christmas, Easter and my birthday all in one. She Types Things: LUKE!!! 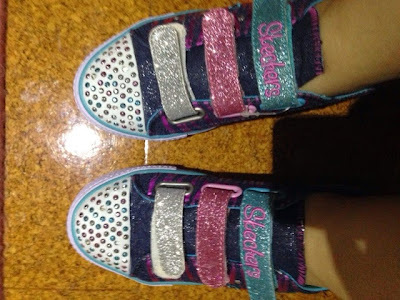 I GOT SNEAKERS AND THEY LIGHT UP AND THEY'RE SPARKLY AND ARE VELCRO TABBED! Luke: Haha, that's awesome. That's like 5 year old you dream come true. She Types Things: No. It's more like 20 year old me dream come true. And it is true. It is a dream come true. I want to wear the shoes to work (I do sometimes, depending on the client), I want to wear them on dates (haha - what dates), and I want to wear them to my 21st birthday (Mum's disapproving look means I probably won't). I love things like that. I love little things that make me happy. True enough, the other day I went to the shops just to buy some red cordial (I also bought a Scooby Doo toy for $5 because it was just too good not to). I have my nails painted pink. I like to laugh. Life is too short to be grown up all the time, but that is not the only reason I love my new shoes. I think they should be a physiotherapy tool. 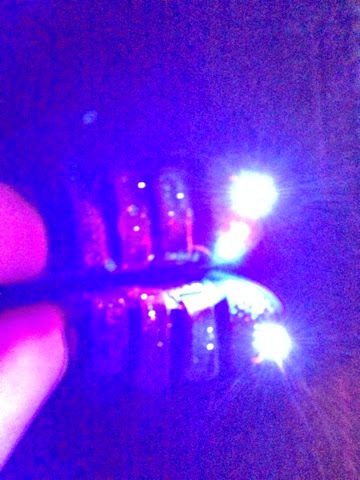 The sneakers light up when they have enough weight on them. They light up on most steps, but if my weight is in the wrong place then it won't. The other thing about it is that it makes me look at where I am placing my weight. 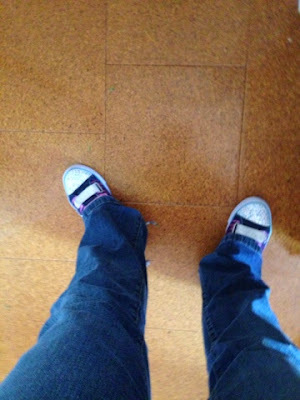 When my sneakers only light up on the right side, I know my centre of gravity is too far to the my right. This isn't uncommon for me - I don't often realize I am doing it. But now, thanks to the most awesome sneakers in the world - I do. I am able to fix my walking and bear my weight more evenly. 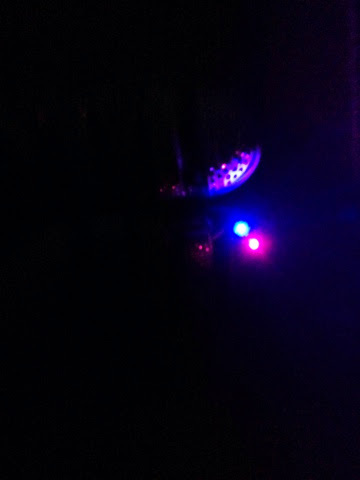 Therapy is most effective when it is in the form of play.... or fabulous light up sneakers. I love it! This was the first blog post I read when I got back because the post title made me smile. Cool shoes!! I really enjoyed this post! My 22-year old daughter has aphasia, too. I love your new shoes! 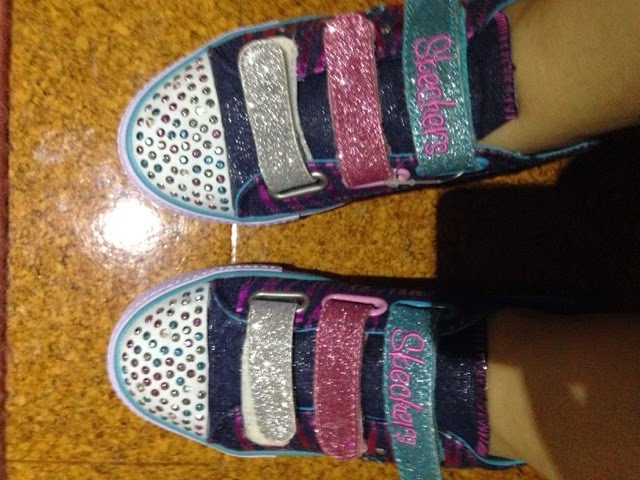 I didn't think they made light up shoes in adult sizes, or do you have tiny feet? I thinks it's awesome that simple things make you so happy! I agree that life is too short not to find something to be happy about and the fact that your new shoes can be therapeutic also is an added bonus!